Buy Prunus Armeniaca Gold Cott apricot fruit tree for sale online from UK specialist suppliers of garden fruit trees. A good reliable modern variety, Gold Cott (Prunus armeniaca 'Gold Cott') was first introduced in the United States of America. A somewhat vigorous apricot, producing healthy relaible crops of good sized fruit. Selected for its suitability for cold wet climates such as the UK. The tree is very hardy, vigorous and resistant to leaf spot. The fruit are medium to large, golden yellow with quite a thick skin, making them ideal for storage in the fridge for some weeks. Also good for freezing and bottling. We commend this variety of apricot, not just because we are the ones selling them but because they are popular for good reason. 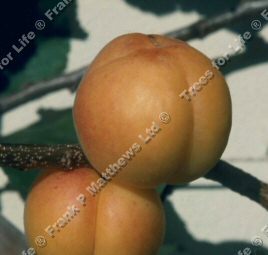 Fertility: This apricot is self-fertile, so no need for another apricot to act as a pollination partner for it to produce fruit.